“God let us plant the seed of the Gospel in many ways. 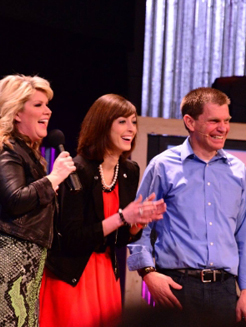 Plus we had numerous opportunities to spend time with Natalie Grant and her daughters. She shared that the filming at our church was one of her favorite places to film,” Pastor Jim adds. If you missed the show in 2014, you can catch reruns on Amazon Prime. Click here to send a note of encouragement to Jim Brown. 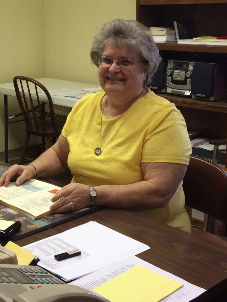 In April 2015 we introduced you to Joyce Fitz, the long-time secretary at the Grace Brethren Church, Waynesboro, Pa. She’s held that position since December 1974. “I have worked with six wonderful men of God (pastors). As of now, the Lord has given me good health so I will continue to serve Him in this position as long as it is His will.” Her current pastor/boss is Tim Clothier. Click here to send a note of encouragement to Joyce. We always like to share stories of new congregations in the Charis Fellowship. 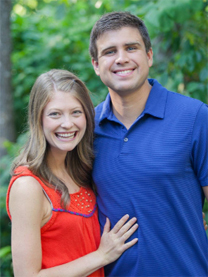 In March 2016, we introduced Joel and Morgan Trainer who had just joined the staff of Movement Church, Hilliard, Ohio (Mark Artrip, pastor), as Church Planting Residents. Still a young church itself and located on the west side of metropolitan Columbus, Ohio, Movement Church was committed to reproducing itself. After a year, the Trainers moved across the metro area and planted Three Creeks Church in Gahanna, Ohio. Following the example of their “mother” church, Three Creeks is planning to reproduce itself somewhere in the Columbus area in the foreseeable future. Click here to send a note of encouragement to Joel and Morgan.